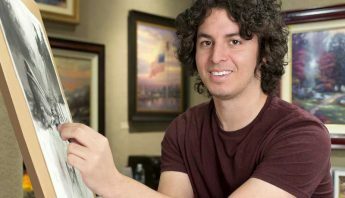 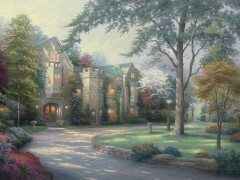 Paintings of historic homes, stately manors, grand castles and majestic inns can all be found in the estates art collection at our Thomas Kinkade signature art galleries in the Monterey Bay area. 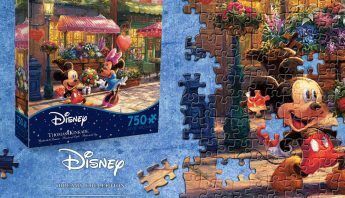 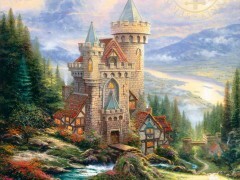 It’s easy to find yourself being pulled into one of Kinkade’s paintings, wondering about the life of the inhabitants inside, and longing to explore lush gardens and secret rooms in castles. 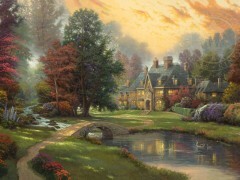 These estate paintings will stir your curiosity and bring warmth and charm to any room in your home or office. 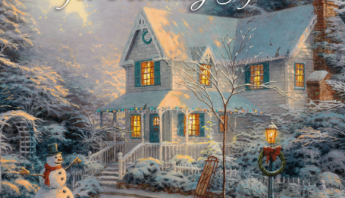 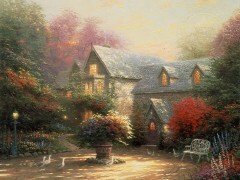 Thomas Kinkade was fascinated by beautiful architecture and the idea that a home was a window into the owner’s world. 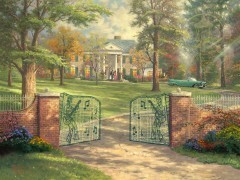 There is a sense of history and the love of family in each and every one of his paintings. 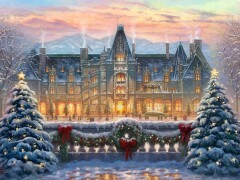 The Christmas season is brought to life in Kinkade’s Christmas At Biltmore®. 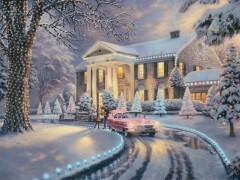 The majestic chateau draped in fresh snow and adorned in lights will surely remind you of your own favorite Christmas memories. 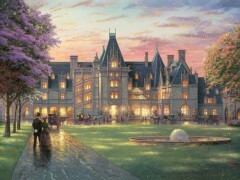 Christmas At Biltmore® embodies the spirit of the holidays and makes a perfect Christmas gift. 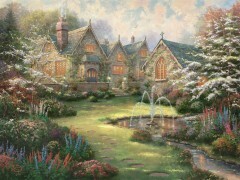 An English manor house was the inspiration for Garden Manor and Lakeside Manor in the Manson’s of Paradise Collection. 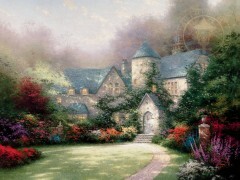 The glowing windows and well-tended garden speak of the love between family members. 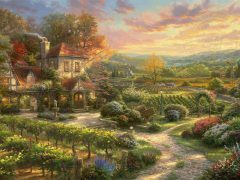 Beyond Summer Gate highlights the colors of summer, while Lamplight Manor explores a hidden majestic manor on England’s quaint Cotswolds. 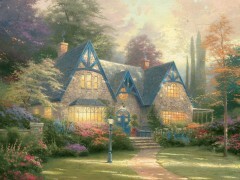 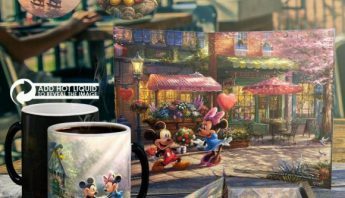 Kinkade also found inspiration in the architecture of American homes. 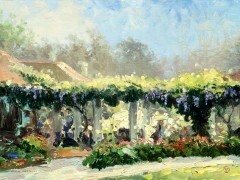 This is apparent in Thistle Hill which showcases a historic Texas home. 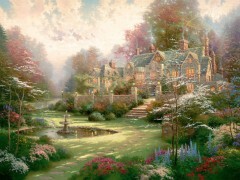 Winsor Manor was especially personal and precious to Kinkade for it celebrated the birth of his third daughter. 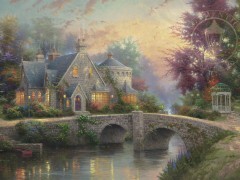 This charming manor house painting is straight out of fairy tale. 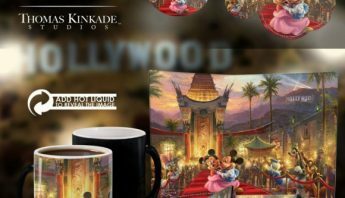 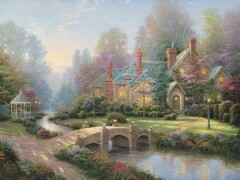 Kinkade created this piece with the dream that one day it would be the home his daughter would share with her prince charming. 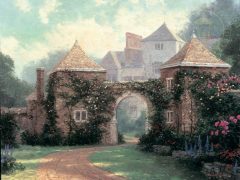 Whatever appeals to you, whether it be a majestic chateau on the English countryside, a monumental home steeped in history, or a fairy tale manor, one of our art consultants can pick the perfect piece for you. 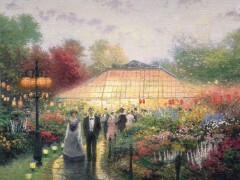 Stop by one of our art galleries in the Monterey Peninsula and view these glorious estate paintings for yourself.